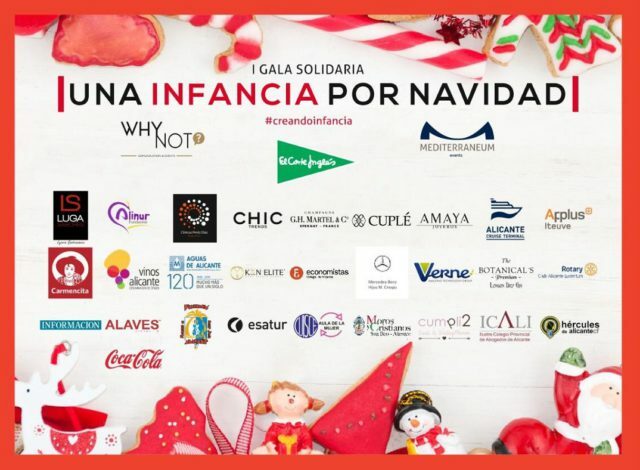 The most CHIC bloggers and influencers support "Creating Childhood"
The influencers and bloggers gathered by CHIC Trends, will be attending the first “Creating Childhood” Gala, with the purpose of helping the most disadvantaged children of Alicante, so they enjoy a happy and Merry Christmas. “Why Not”, an initiative promoted by Anabel Rosas and Mediterraneum Events, is a charity event in favor of Cáritas and the Red Cross Alicante. The event, which will be held on the 30th of November, will be a beautiful evening, full of excitement and many surprises, including the lighting of the Christmas tree. Creating Childhood is a solidary project whose objective is that no child grows-up deprived of his childhood for economic or health reasons. For this reason, those children who live amongst families with no resources, as well as those who suffer some type of disability or illness preventing them from carrying out a normal daily life, will be the beneficiaries of a multitude of actions that will be promoted from a private initiative in close collaboration with non-profit organizations that work on projects related with children. CHIC Trends Magazine is happy to collaborate in events such as Creating Childhood, contributing to this cause. We hope to keep on collaborating in the years to come! Next we present you the amazing team that will be supporting us on this charity, the most CHIC influencers! Thanks to all of you! Expert Healthy lifestyle. @LoDiceisa is a great community focused on multifaceted and real women. She uses her networks to share all her experiences, healthy recipes, nutritional and sport tips and motivates her followers to follow a healthy and happy lifestyle. She is passionate about fashion, business, investments and art. This businesswoman is the director and founder of a real estate investment company called Billions Project Luxury Realtor & Fashion Communication Advisor. Trained as a fashion designer, AF is currently a blogger and Influencer who shares his own outfits in his Social Media. He enjoys showing his ‘total look’ and risky garments combinations, with very eclectic results, staying true to their own style. You will find him in numerous fashion shows, parties and events. HIs looks are different and daring and his charisma push brands to bet on Aaron as ambassador, who works not only with fashion firms, but also with beauty and lifestyle brands. Paloma Amo professionally works as an interior decorator, her enthusiasm in Social Media has led her to also dedicate herself professionally to collaborate with fashion, decoration, beauty and lifestyle brands to share their products. In addition to that, we can read her fashion and decoration articles in the Diario Información newspaper in Alicante. Occasionally she also carries out styling work for fashion editorials and is a design consultant for shoe firms. Creator of alicantestreetsyle blog. An online space where she shows the most striking outfits seen around the streets of Alicante, as well as the most cool shops and the most attractive gastronomic plans. Currently we can read her articles in the weekly fashion section of El Mundo newspaper. She currently studies journalism at the University of Murcia. She works as an editor-journalist on the UM channel (online tv) and is also a Community Manager of a physiotherapy clinic. In her free time she usually watches series and movies, reads novels and hikes with her pets. She always tries to enjoy life, traveling and spending time with her people. She is 28 years old and was born in Alicante, Tanie has a university degree in Tourism and a lot of experience in the sector. A lover of fashion, her motto is: “Dreams, when they are shouted, they are fulfilled”. In her blog she shares her fashion looks. Angelica founded the fashion and trends blog Miss A by Angelica, a blog that started in 2014 when she lived in the Czech Republic. She teaches English at a private school in Alicante and collaborates with Theomoda Magazine. “Una Italiana En Alicante” is a blog is Talita Campagnaro’s Blog, which is themed towards “lifestyle”. She publishes hier experiences and trips as an Italian living in Alicante. Mejora Tu Empresa, is a business consulting enterprise headed by Alexis Rosas. In his blog and social networks he deals with different topics related to business management, current affairs and gives advice to entrepreneurs. She works for an Italian cosmetics firm and is currently developing her personal projects and preparing to take on new challenges. She is a graduate in Biochemical Engineering and Genetics. She is deeply passionate about traveling, fashion and horses. She collaborated with CHIC Trends and Mas Que Salud magazines as an editor and translator. She volunteers with the Red Cross and was an aid worker in Tanzania last year. She is head of Ana Espadas Communication Agenc as well as the magazines Más Que Salud and CHIC Trends. She has a Degree in History of Art. She is an specialist in local media and advertising. Born and raised in Alicante, although she has developed part of her professional trajectory in the United States and Italy. “In love with my land, with my work and with the people I meet on the road”. Carlos Roos is a graphic designer and fashion & advertising photographer who graduated in the European School for the Visual Arts (Alicante, Spain). He currently has his own studio at the Cutural Association “ágora espacio creativo”. Born in Venezuela and currently living in Spain. He is a freelance photographer who specializes in adventure photography and outdoor commercial photography. Currently, co-founder of Ágora Espacio Creativo in Alicante. Follow the most CHIC influencers and don’t miss out on the Gala details, we hope you can join us!